At last year’s Federation of Children’s Book Groups’ Conference, I found myself having breakfast at the same table as a lovely lady, who turned out to be Sarah- the brains behind Bournville Book Fest! Having chatted for a while, I said that if she ever needed an extra pair of hands to let me know. And so, to my delight, she did! Having left school earlier than I have ever done before, I made my way up the M5 to Birmingham. Sarah had kindly invited me to dinner with the authors and I was delighted to be able to attend. After a very interesting (!) taxi ride, I arrived at the Bournville Community Hub, a wonderful space, where everyone was gathering. The following morning, I was up bright and early and made my way to the Blue Coat School where the day’s events were to take place. Everyone was busy, preparing for the day ahead. Bravely ignoring the lure of the bookshop, I helped set things up and before we knew where we were, members of the public were arriving for Jacqueline and Nick’s event. A ripple of excitement ran through the audience when children spotted Jacqueline Wilson through the curtain before she came on stage, once again reminding me just why children listening to authors is so powerful and important. There was a lovely atmosphere as the crowd hung on her every word and found out more about her life and her work. Nick Sharratt then taught everyone- including Jacqueline- how to draw some of the iconic characters she has created in words and he in images. His step-by-step guidance led to some excellent drawings and inspired many illustrators-to-be! Everyone was delighted when they found out that both these lovely people were signing books today. The queue was massive and there were some very moving stories about letters Jacqueline had written to people when they were younger which had inspired them and the effect reading her books has had. It was very heart warming! Whilst they were valiantly signing, Tracey Corderoy had taken to the stage next door. Always a joy to watch, Tracey entertained her audience brilliantly with fun and games. Sadly, Steven Lenton was unable to join her as he is poorly (get well soon, Steven! ), but Tracey rose to the challenge and taught everyone how to draw Slippery Sam. Excellent fun was had by all! It was a pleasure to mingle and chat to those there whilst writing names on Post-Its and directing queues. There was a lovely crowd, very supportive of Sarah’s work and appreciative of the effort she puts into this venture. Local people are very proud of their festival. Robin Stevens spoke next, fascinating young sleuths with insights into her work. She had her audience completely captivated and many were obviously ardent admirers who had brought their entire Wells and Wong collection with them to be signed! Whilst signing, Robin patiently answered question after question, inviting children to contact her via her website. One man was visiting from America and was delighted when he noticed that these were the books his daughter was reading back home! He showed me a photo of her, clutching the American editions. James Mayhew’s ‘Ella Bella’ event had taken place in another part of the school so I hadn’t had a chance to see him; however, I caught up with him when he came over to take part in the Big Drawing Challenge. 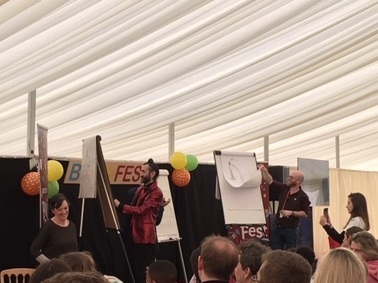 This was a fabulous event with lots of children joining the illustrators on stage and working with them to create amazing pictures! What a wonderful festival Bournville Book Fest is! Huge congratulations to Sarah and her team for making it happen- and look so easy! The wonderfully warm, friendly atmosphere has not happened by accident- a huge amount of care and preparation have gone into this occasion and that personal touch speaks volumes. Thank you so much for offering me the opportunity to help out today- please ask me back next year! Older PostShifty McGifty and Slippery Sam: The Aliens are Coming!